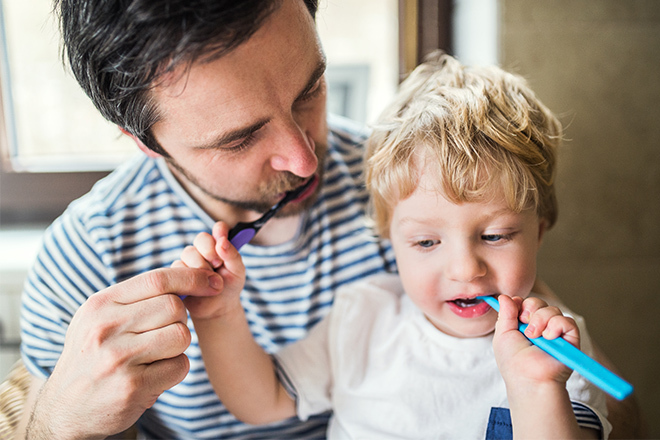 It’s important to teach your child good oral health habits that will stay with them for life. The first step is choosing the right toothbrush – one designed especially for children aged 2-5 years. These toothbrushes have small oval heads, soft bristles of different heights and a non-slip, cushioned handle. The novelty of electric toothbrushes might also appeal to your child. Some electric toothbrushes can give a slightly better clean than manual brushes, but it’s best to go with what your child prefers. Brush your child’s teeth twice a day – morning and night. Stand or sit behind your child so she feels secure. Being in front of a mirror is good too, because it lets you see your child’s mouth. Cup your child’s chin in your hands, with their head resting against your body. Angle the bristles of the toothbrush towards the gum. Move the brush in gentle circles to clean the outer and inner sides of the teeth and gums. Lift your child’s lips to brush the front and back of the teeth and at the gum line. Brush back and forth on the chewing surfaces of the teeth. If you’re using an electric toothbrush, avoid moving the brush in circles. Keep your hand still, and guide the brush across your child’s teeth and gums. Your child might want to start helping to clean their own teeth. Letting them hold the toothbrush with you will help them feel their part of the action. But your child will need your help and supervision with cleaning teeth until they are about eight years old. For more information on how to help your child create good dental hygiene habits visit Health Direct. Further resources are available at the Raisingchildren.net.au website.